For Executive Coaches, Personal/Life Coaches and Coaches in the Workplace…..
One of the most challenging parts of any coaching in the workplace relationship is dealing with clients who are weighed down by emotional issues. Unless these are correctly identified and resolved, the coachee is unlikely to be able to make significant progress and the coaching outcomes will be unsatisfactory for all parties involved. Back in 2002 I was one of the original developers of a coaching model that helps individuals get the best from everyday life. In addition, I have integrated aspects from the field of Positive Psychology, which aims to increase an individual’s basic appreciation of life, well-being and general happiness. Cognitive Behavioural Coaching is a model that works for coaching clients in everyday situations. While there are many excellent books about the CBC approach, none of them focus directly on coaching emotional issues in the workplace. 1. An E-Book – detailing the 7 major emotions, how to recognise them, their potential impact on the individual and organisation, and how to best deal with them. 2. A Companion Workbook containing a wealth of practical exercises to assist the coaching process. An introduction to the basics of Cognitive Behavioural Coaching and how this approach can be used with a range of coaching clients in dealing with emotions. Powerful Skills that can be used both in a work setting and the Personal/Life Coaching arena. A basic framework for each subject with a key learning points section for each topic. The Workbook provides an extensive range of exercises covering physical impact, thoughts, feelings and behaviours. All the templates and details you need to start coaching straight away. An overview of some of the main skills associated with Cognitive Behavioural Coaching to broaden your understanding and knowledge. Click on the ‘Play’ Button below for a short message I’ve recorded especially for you about this handbook. Emotions at Work – Nearly 100 pages of easy to follow, powerful information, presented as 2 separate PDF files (zipped together for convenience) at the very affordable price of £29.97 + VAT. Click the ‘Buy Now’ Button below and get your copy now. 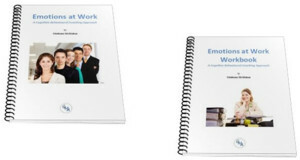 If you’re an Executive Coach, or Coach in the workplace, I know the Emotions at Work E-Book and Companion Workbook will quickly become an invaluable resource and reference guide in your coaching library. Once you place your order, you’ll be directed to a confirmation page. The link to the download page will follow shortly afterward by email so you can start reading immediately (no waiting around for shipping!). Please note this is a ‘virtual’ product – the graphic is for illustrative purposes only.